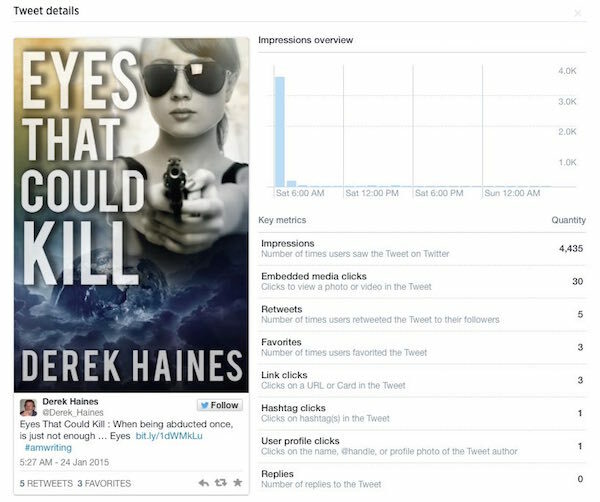 Twitter is great for author promotion, but does Twitter sell ebooks? Twitter has become the go-to social media platform for self-published authors over the years. Perhaps this happened because both self-publishing and Twitter were launched at roughly the same time, or the immediacy and ability to blatantly flog a product on Twitter was a better fit than other platforms that constrain or demand payment for product plugging. For whatever reason, Twitter has definitely become seen as the essential platform for self-published authors, but is it effective in delivering what authors want? Book sales. Does Twitter sell ebooks? I can only speak from my own experience, and as I have a substantial Twitter following and use Twitter and Google Analytics, I have access to a sizeable amount of data to correlate against my own books sales. The image below is an overview of my Twitter account for the last 28 days, with the important number being profile visits, which are visits to my Twitter profile page from a Tweet. 17,000 is good of course, but how many then click the link through to my website? 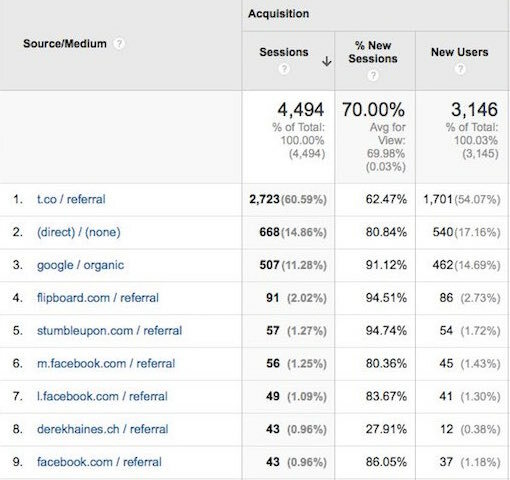 For the same time period, here are the statistics for my site visits from Google Analytics, with Twitter (t.co) clearly leading the way with about a 15% conversion rate of profile visits to site visits. This is a great conversion and says a lot about the power of Twitter for promotion, and especially for websites and blogs. But what about a single book promotion Tweet. Do people click on buy links? This is where promotion is one thing, and book sales conversions are another. Only three link clicks through to my book on Amazon, even though 4,435 people saw the tweet and 43 people engaged with it. That is a very small conversion rate, and no surprise to discover that I did not sell one copy of this book on the day of this particular tweet. But, three people did go to my book page on Amazon, so it had a small positive result. My book sales have remained steady, and I have never seen a correlating jump in book sales when I increase the number of my book tweets. I have tried this experiment many, many times. However, I do believe that book tweets can still be useful as a means of building awareness. Think of roadside billboards. No one runs off to buy when they drive past one, but they do build product awareness. So from this logic, keep in mind that tweets with images (book covers) attract more than ten times the engagement over text tweets, and really help reinforce awareness, which may convert the next time a potential book buyer readies to make a purchase. So what does this small sample of my Twitter data prove? It proves that Twitter is a fantastic promotional platform, and is very effective in attracting people to information, such as blogs, articles and creating awareness of your books. But it is, like most social media platforms, not great as a means of direct selling. So use Twitter to promote yourself as an author, and encourage people to interact and get to know you, but as for flogging books to strangers is concerned? Nope. It doesn’t work well at all. But, in building awareness and product recognition, it’s a winner. So in the long term, Twitter should have a positive effect on your book sales, if you are patient, and don’t expect instant results. You’re 100% correct, Phillip. We have all come a long way since 2009. I put a lot of effort into book metadata now to help readers find my books, which is very effective. Twitter still has its uses though, especially for free ebook promos. While it’s true to say Twitter doesn’t sell books, I think it does help in creating brand recognition over time and is a wonderful platform to build a blog audience. Full disclosure: I am a writer, but not a self-published writer. And while I am open to buying the occasional self-published book (though so far maybe 5 percent of the ones I’ve tried to read were even competent, never mind “good”), in my case, I refuse to buy anyone’s self-published book that’s being shilled on Twitter. Self-pubbers are ruining Twitter like overbearing networkers at a cocktail party. Because my bio says I’m a writer, a good 80 percent of the people who “follow” me immediately declare that they are “authors” and then post nonstop about their Kindle ebooks. You would think the entirety of Twitter is comprised of aspiring writers. Maybe if authors spent half the time improving their writing that they waste trying to create a “platform,” self-published books wouldn’t be so abyssmal. Hell, maybe some of those writers could get real publishing deals. While I agree with you, Ace, in that Twitter is a bit of a book swamp, there are two points that should be considered. One is that Twitter’s algorithms encourage following based on common interests, so naturally, this results in the crazy situation of authors following authors, which of course is not tremendously productive. The second point is that traditional publishers and literary agents are just as active on Twitter. I started collecting a list of literary agents, and stopped bothering after 200 or so. Also, traditional publishers have a huge number of accounts. Take Simon & Schuster for example. They have at least 20 Twitter accounts! Then there are the authors who are instructed by their agents to add their publisher and agent’s name to their Twitter bios. So I have to say that self publishers shouldn’t get all the blame for making Twitter a book swamp. Traditional publishers and literary are just as guilty, because they insist on their authors being active on Twitter and other social media platforms. So getting a real publishing deal doesn’t change much for authors. Many traditionally published books are also not very good. To state that most self published books are less than perfect and not worth the time suggests a closed mind. I have published books both ways and my experience has been that if you use a publisher it takes a long time to get a book out. Not to mention that the royalties are less than a writer can receive through self publishing. We are now dealing with a paradigm shift, suggesting that indies will become much more competitive and accepted by the marketplace. Things eventually will sort themselves out. Bad books will fade away and the better books will continue to sell. I agree, Andres. The reading market will decide, and isn’t that how it really should be? Lesson learned, Derek. I’ll include my book cover in my tweets, and expand who I follow. I thought following authors was beneficial. It always depends on how you look at things, Mary. For an author, following authors may seem unproductive, but then again, authors usually do buy books and read. This can’t necessarily be said for Joe the plumber, or Sue the SEO expert. I’ve given up on twitter and don’t normally post directly to it, just via my facebook feed. Indeed today was probably the first time I looked at my twitter feed for some weeks because it is just people flogging books I’m never going to buy, and which I’ve seen sold elsewhere. The only way to make sense of Twitter, Jim, is to use lists. When you create a list of only those Twitter accounts that interest you, your list’s stream is clean and informative. I have a lot of lists, and with each one, I can get information that interests me on certain topics. That’s the problem, there’s very little posted on twitter that I actually want to read. Not in a mere hundred and forty whatever characters. I have my account set up so if anybody ever contacts me, I get an email and can respond, which doesn’t happen every month. Interestingly I purged the list of people I follow, I realised I was being encouraged to follow people with the same interests, which as far as I could tell meant they wanted to sell books as well. I look at the people who keep signing on to follow me (gods alone know why) and they too have books to sell. The only experiment I did to compare and contrast methods of communication was to look at hits on my blog. This is advertised on twitter, facebook, goodreads, linkedin etc etc. I think it can work if you’re the sort of person who is willing to spend a fair bit of time on it. One daughter rather lives on her phone and is constantly tweeting stuff, some of it quite funny, that happens to her. But her comment was that she never, under any circumstances, tries to sell because it just drives people away. Being informative always works well on Twitter, Jim. I just got a nice thank you ‘tweet’ for a tip I posted on my blog this morning. It’s only by ‘giving’ that sometimes you get something in return if people take an interest in what you have to say, and investigate further. And then discover that I write books. I get a lot of messages from people saying that they have followed my blog from Twitter, and have bought a book or two. But this usually happens after they have followed me for quite some time. I’ve been on twitter for about a month and this comes as no surprise. I agree that as long as it’s used with a light touch it may go some way to promote a modicum of ‘brand awareness’, but the usefulness of that is not measurable. I suspect any benefit from that down the line is likely dependent on luck, or rather happenstance. I continue to use it for other reasons. First, I’m told to by experts, and I’d be an idiot not to do everything I’m told at my stage in the game — I can ignore the experts when all has failed. Apart from all the spam and bull, I have picked up a lot of insights and tips from it about publishing and the publishing world. As an isolated writer, it also gives me some level of interaction with other writers and people who enjoy reading fiction, which is better than none. It also can come up with some interesting info or news relating to other arts besides writing. On the whole, though, I’ve found it an extremely depressing load of crap, and I’ve doubted its use as a promotional device from day one. One thing I’m sure of: the way it’s used by publishers and agents, by and large, can’t be doing them many favours. It’s mostly spamming and banality, too often with a little whiff of privilege and smugness. They are both compelled and constrained professionally, though, so I can’t blame them. It just doesn’t come across very well. Mind you, I haven’t the foggiest how to come across well myself, so I can’t talk. Most of my energy on twitter is spent repressing drunken rants. I think more of those by everyone would make twitter much more interesting, and sales wouldn’t suffer because we’ve established twitter doesn’t effect them anyway. So, chin-chin. It’s wise to keep a balanced view about the usefulness of Twitter. In today’s book market, it is only one small piece of the puzzle. But used well, it can be (somewhat) beneficial. And yes, chin-chin! I agree with this article. Twitter really doesn’t help with book sales, but I can say that it has helped in getting traffic over to my blog: “The Struggling Indie Author”. Yes. Second to Google Search, Twitter is the next best traffic driver.